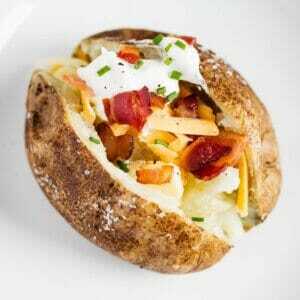 Learn how to make the perfect baked potato with these simple tips and tricks! Your potato will be perfectly soft and tender on the inside, with a crisp and well-seasoned skin. Add your favorite toppings to make an amazingly delicious loaded baked potato! Preheat oven to 400° and line a baking sheet with aluminum foil. Spray foil with nonstick spray. Give potatoes a good scrub and then dry them completely with a paper towel. Lay potatoes on foil-lined baking sheet, then brush all over with olive oil. Sprinkle with coarse salt. Pierce potatoes a few times with a fork or knife. Bake in preheated oven for 1 hour, or until potatoes are soft and tender. Slice in half, then add your favorite toppings. Enjoy!